I did have some luck – certainly better than my dad did with his writing. He was always rather secretive about it when I was young. I can understand that much better now, though at the time I’d have loved to see what he’d written. The only things he ever showed me were some jokes sent to Reader’s Digest – if I remember rightly, for their feature ‘Humour in Uniform’. I never quite got the jokes, probably because I’d never been in the armed forces myself. Sadly, I don’t think they ever accepted any of Dad’s stories, though to his credit he went on trying for many years. I’m sure he wrote other things too. His favourite author of fiction was P. G. Wodehouse. I have all PGW’s books now, arrayed on my bookshelf, including a number of relatively hard-to-find early works that I managed to track down for Dad in his later life. I love PGW too, and there’s something special about reading Dad’s beloved editions, all smelling delightfully musty, and just a little yellowed in the page. 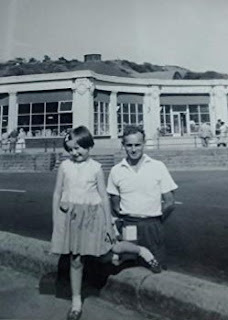 Dad also loved science, though he never had much of an education, having left school at about twelve. Like his two brothers and his sister, my Aunt Hilda, who is still going strong at 91, he passed his 11+ scholarship to go to grammar school but was unable to take up the place as his family could not afford the uniform and needed him to start earning some money. One of his earliest jobs was as a telegraph boy in Pontefract Post Office – and that’s where, a few years later, he met my mum (but that’s a story for another day). OK, so the smoking didn’t set me a great example (I’m pleased to say, however, that I’ve never smoked), but the hours of study certainly did, and I owe anything I’ve ever achieved to my dad’s example of hard graft. Studying till midnight every evening, then up before six next morning to catch the bus to Leeds. Dad would have been 95 last week, on July 25th. According to Aunt Hilda, he was born on a blazing hot day in Bristol, where his mother had gone to stay with her family. They moved back up to Pontefract, West Yorkshire, when he was three months old. My dad wasn’t always easy to get on with. I don’t think he had a great relationship with his own father, who died when George was 16. Times were hard when he was young. His family were doing quite well until his father, a cabinet maker, caught TB. He had to stop work and the family had no money coming in (no sickness benefits back then, and medical help had to be paid for). He was a wonderful grandad to my children and they remember him very fondly. 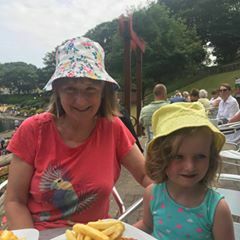 My granddaughter Daisy is now four, and we had a long conversation the other evening where she asked me lots of questions about my mummy and daddy, and I showed her pictures of them. She was delighted to learn that Dad’s middle name was Henry – which happens to be the name of the boy she has decided to marry. Does life hold any deeper pleasures than telling your little granddaughter about your own childhood, your parents and your nana? Not many, certainly. Daisy also asked me whether I would die one day. Oh, these questions… I told her yes, but I hoped not until I was a very old lady. She looked at me uncertainly and said, ‘Nana, are you a very old lady now?’ I assured her that I wasn’t and had no intention of becoming one for a very long time. She seemed satisfied. I hope I live long enough to have a little more luck with publishing. But if not, I still see myself as amazingly fortunate – never to have known war, to have always lived in safety and comfort, to have had the parents I did and to have the family and friends I do now. And to have that example of the smoke-filled dining room, electric fire going full blast (I know, I know – but there was no alternative), and Dad poring over his notes. Good for you, Ros, bringing your dad back for some of the limelight he'd have enjoyed. As for what our grandchildren ask - many years ago, when my grandson in Glasgow was about 4, I had to promise him I wouldn't die. Recently (he's now 18) I visited his mum/my daughter and we all went to our usual restaurant. I sometimes use a stick nowadays (mainly for sympathy), and he told his mum it upset him seeing me with it. Maybe he remembers the promise, too, and knows now I'll have to break it some day. But, like you, I think our generation has been the luckiest. A fascinating post, Rosalie. What an amazing life your dad had, and what an interesting person. The question re- death and children's curiosity about it is a complex one. It must be the first major philosophical challenge small children have to face. I remember my then two year old son coming across a dead pigeon in a park in Gothenburg, and how disturbed/fascinated he was, and yes: can this happen to people? Yet I can remember no such incident from my own childhood. My first remembered encounter with death came very many years later. What a brave man your father was. The gunner in an RAF plane had one of the worst chances of survival of all military roles, I’ve heard. What a lovely post about him, your mother and your childhood, moving on to the next generations to come. Your grand daughter sounds a delight! What a beautifully written and moving tribute: Your dad was a true hero in every way, in the world and blessed to his family. 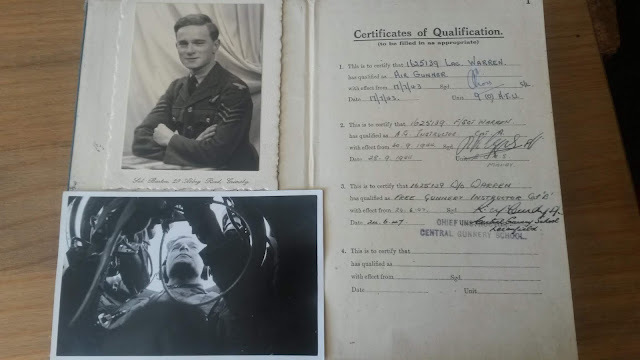 Your memories about your dad make wonderful reading, and have rekindled some of my own memories of my dad, who was a couple of years younger and did pilot training in Arizona at the end of the war. It wasn't all hard work - they got to go to Hollywood and were welcomed like heroes. A chum of my dad's told me later they met Olivia de Havilland among others (she's still alive, I believe.) He wanted to write his memoirs when he retired, but sadly it was never to be. When my son was about four, he met a friend's mother who had a birthday coming up. My son asked her how old she was going to be and she answered "70." With a very grave face, my young son turned to her and said "you'll be going to heaven soon, then." Thankfully that lady is still with us! Thank you, Julia. Parents are always deeply important but there is something very special about our parents' generation, I believe.